She’s not a quitter, she won’t throw in the towel. You threw in the towel a long time ago. In the matter that put us in opposition to China, the European Union threw in the towel by agreeing to reassess the import quotas. Every time something didn’t work, we just threw in the towel and said, “Let’s forget it.” Right? You think about throwing in the towel, retiring. Origin of “throw in the towel”. 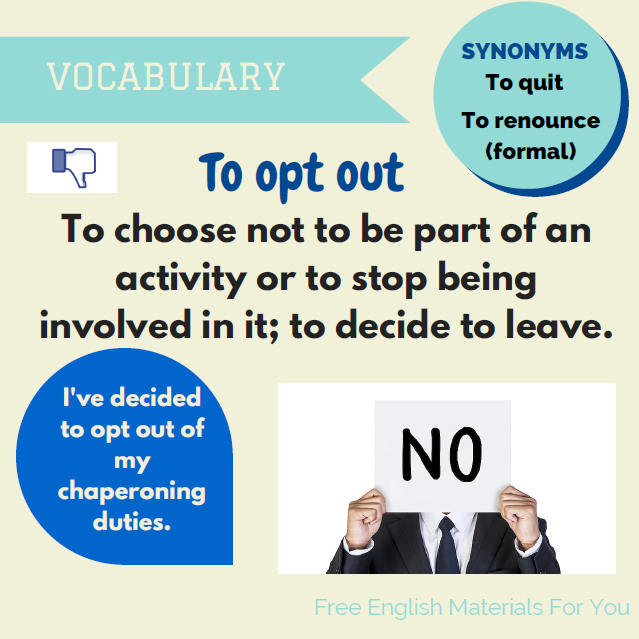 “To opt out” – What does it mean? Passengers shall be entitled to opt out from a security scanner. Like every other country, since the Treaty of Amsterdam Denmark is entitled to opt out of any matters relating to military initiatives. Jane decided to opt out of the project. Just, from now on, if we make any changes, we have to let people opt in rather than forcing them to opt out. CHAPERONING => to attend or acting as a chaperon. CHAPERON => any adult present in order to maintain order or propriety at an activity of young people, as at a school dance. TO ENTITLE => to give a right to (someone).